Players from the age of six (both boys and girls) and Saturday and Sunday adult elevens. The club plays in the Four Counties Cricket League. New new members are welcome and spectators and social members are welcome to come and support the club with a friendly bar in an idyllic setting. The first reference to cricket being played at Olney appeared in the Almanack of 1883 and refers to matches played by Olney Cricket Club in the 1882 season. 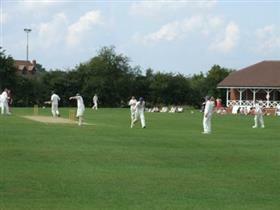 Olney Town Cricket Club information on membership and fixtures is on its website - click below.